GBoost is a simple program which helps increase the speed and performance of your computer with a single click. It allows better performance by closing unused and unnecessary programs and disabling things which create graphics effects when unneeded. The program includes a dial and a list of values indicating the usage of CPU, memory, processes and services. After you have used the program to increase performance, you may "Press to Restore" to put your system back to the way it was which is perfect if you're running an intensive game, for example. 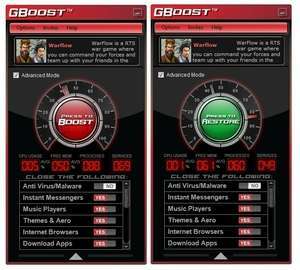 For security reasons, you should also check out the GBoost download at LO4D.com which includes virus and malware tests. Additional screenshots of this application download may be available, too. GBoost has a presence on social networks.